The illustrator, designer, and writer Edward Gorey (1925-2000) is beloved for his droll, surreal, and slightly sinister drawings. While he is perhaps best known for his fanciful, macabre books, such as The Doubtful Guest and The Gashlycrumb Tinies, his instantly recognizable imagery can be seen everywhere from the New Yorker to the opening title sequence of the television series Mystery on PBS. 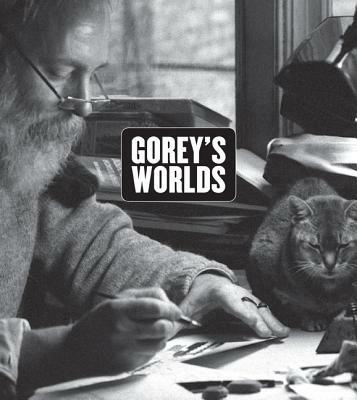 Gorey's Worlds delves into the numerous and surprising cultural and artistic sources that influenced Gorey's unique visual language. Gorey was an inveterate collector--he called it "accumulating." A variety of objects shaped his artistic mindset, from works of popular culture to the more than twenty-six thousand books he owned and the art pieces in his vast collection. This collection, which Gorey left to the Wadsworth Atheneum Museum of Art upon his death, is diverse in style, subject, and media, and includes prints by Eug ne Delacroix, Charles Meryon, Edvard Munch, and Odilon Redon; photographs by Eug ne Atget; and drawings by Balthus, Pierre Bonnard, Charles Burchfield, Bill Traylor, and douard Vuillard. As this book shows, these artistic pieces present a visual riddle, as the connections between them--to each other and to Gorey's works--are significant and enigmatic. The essays in Gorey's Worlds also examine the artist's consuming passions for animals and ballet. Featuring a sumptuous selection of Gorey's creations alongside his fascinating and diverse collections, Gorey's Worlds reveals the private world that inspired one of the most idiosyncratic artists of the twentieth century. Erin Monroe is the Robert H. Schutz Jr. Associate Curator of American Paintings and Sculpture at the Wadsworth Atheneum Museum of Art. She is the author of Andrew Wyeth: Looking Beyond. Robert Greskovic is a dance critic for the Wall Street Journal and the author of Ballet 101. Arnold Arluke is professor emeritus of sociology and anthropology at Northeastern University. His books include Just a Dog and The Photographed Cat. KevinShortsleeve is associate professor of English at Christopher Newport University. His books include Thirteen Monsters Who Should Be Avoided.